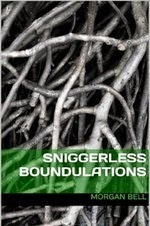 Sniggerless Boundulations by Morgan Bell is a collection of fifteen short stories, with the shortest being 127 words and the longest 1499. Morgan Bell is an Australian Indie Author who resides in Sydney NSW. Sniggerless Boundulations is her first book, being published in January 2014, with short stories being previously published in anthologies. Her short story Midnight Daisy was awarded a story commendation. This book has left me feeling a little neutral. I cannot say I enjoyed it, nor can I say I disliked it. There is a good balance of different stories that express different observations of life but some just left me scratching my head wondering what the purpose of it was. I am still not sure if this is a good thing or a bad thing. Whilst scratching my head I was at least thinking more deeply about the content and meaning of the story. Those that did not leave me wondering tipped the other scale with a thought provoking ending. I suppose this is where the balance fits so nicely. Morgan Bell has done a wonderful job of using few words to say so much. I give her credit for this as this is something that a lot of writers struggle with and a skill within itself. Morgan Bell seems to have got it down to a fine are. If you are a fan of short stories then you are sure to enjoy Sniggerless Boundulations by Morgan Bell. Even though Sniggerless Boundulations has left me neutral I will be watching to see what Morgan Bell comes up with next. My recommendation: give it a go and let me know!